Welcome to The Relay’s evaluation of the recent Saitek HOTAS announcement. 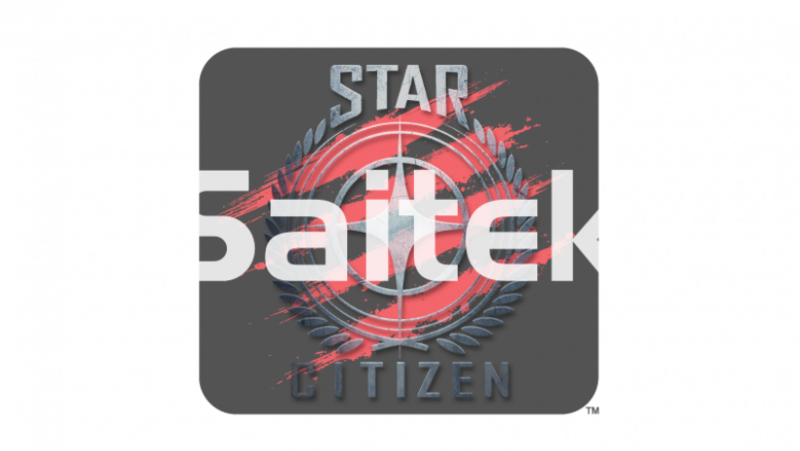 Several weeks ago, CIG announced that they would be partnering with Saitek to create the Star Citizen HOTAS. Then, at Gamescom, we were shown the first images and models of the HOTAS itself. This article will run down everything we know about the Star Citizen product line, but first, the exciting part. The Relay reached out to both CIG and Saitek. Seconds after posting this article for the first time, we heard back from Saitek. As such, we retracted the article in order to complete it as originally intended. Saitek’s responses to our questions can now be found at the bottom of the article. And they are more than worth reading through to get to. Who are Saitek, and where do they come from? While Saitek began by making electronic chess games, they have since diversified heavily, delving into driving and flight controllers, and audio products. More importantly for Star Citizen fans (for reasons that should become clear below), in 2007, Saitek was purchased by Mad Catz. Also contrasting poorly are numbers on the mouse market dominance. Recent data suggests that Mad Catz are the third largest distributor of mice, holding ~5% of the market share, behind Razer, with 31% of the market, and Logitech, with 40%. *6 Initially, these numbers do not look terribly good. Mad Catz is clearly a smaller company, behind industry giants like Logitech and Razer, at least for mice. Luckily, we’re not here to talk about mice. At least not chiefly. We’re here to talk about Joysticks, HOTAS, simulation peripherals. And for those, Saitek is #1, and has been for two decades. Before we delve into our analysis of quality control, keep in mind, this is one of the questions we asked Saitek, and they gave us an excellent answer below. Saitek joysticks are rumoured to have some quality control issues. Loose springs, deadzone issues, sticks arriving dead… reports of problems with Saitek quality are prettily easily found, often accompanied by reports from people who swear by the company, and have never had a problem. Even in the Star Citizen community, upon the initial announcement by CIG that Saitek would be making the controller, there was trepidation, worry, mixed in with joy and anticipation. Some people think that Saitek is great, some people worry its quality suffers. So lets review. Mad Catz is becoming the go-to name for professional fight sticks, a niche market that exploded in popularity with the release of Street Fighter IV. Saitek are owned by Mad Catz. And, most importantly, CIG know that Saitek have a reputation for Quality Control issues. Not only are CIG aware of Saitek’s history, Saitek has a chance here, a chance to do what Mad Catz did with SFIV. Star Citizen will be the first new space game that benefits from a joystick in a long time, and it’s a perfect chance to innovate, to improve. That’s not to say they will. Anything could still go wrong. But Mad Catz improved with SFIV, so history is behind Saitek. There’s one more point to make about Saitek before we move on to discussing the HOTAS itself, and the point comes from a conversation Disco Lando had in the RSI chat boards. Long story short, not everyone is willing to innovate, to try something new, and that’s what CIG are doing. CIG are trying to change space games, and the game development process itself. Why would they be content with sticking with the same joysticks that have been around for decades? What kind of an analysis would this be if we didn’t talk about the product line itself? Not to mention the Saitek answers to our questions are still waiting somewhere below! So, let’s move on. Now, a number of different peripherals were announced during the Gamescom presentation, with concepts shown. A question remains about this though; will this feature only be usable with the Mad Catz keyboard, or will other brands (and even older Mad Catz hardware) support the same functionality? Especially since the Throttle looks small and unstable, and likely won’t function properly without being attached to either a keyboard or the stick itself. 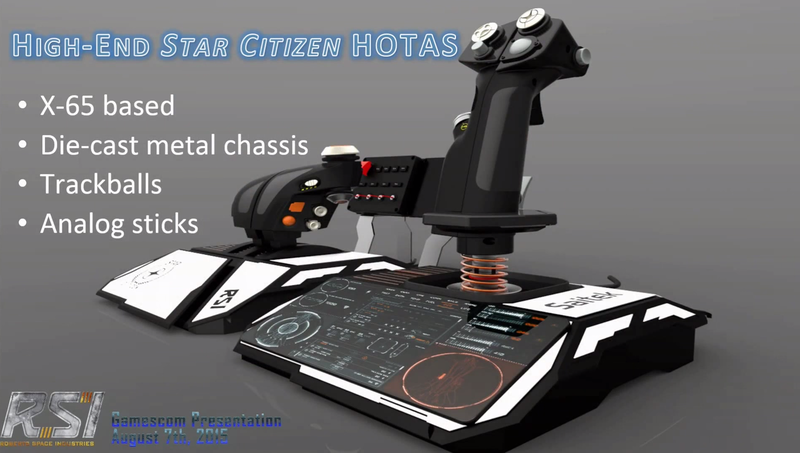 The ‘low-end’ HOTAS itself looks similar to the Saitek X-52, but has a few added extras, put in for Star Citizen. The addition of two trackballs, one on the stick and one on the throttle, for example, should help with a number of the game’s systems. Not to mention, the throttle is much smaller, and the addition of switches under the stick should make a decent addition to the HOTAS. 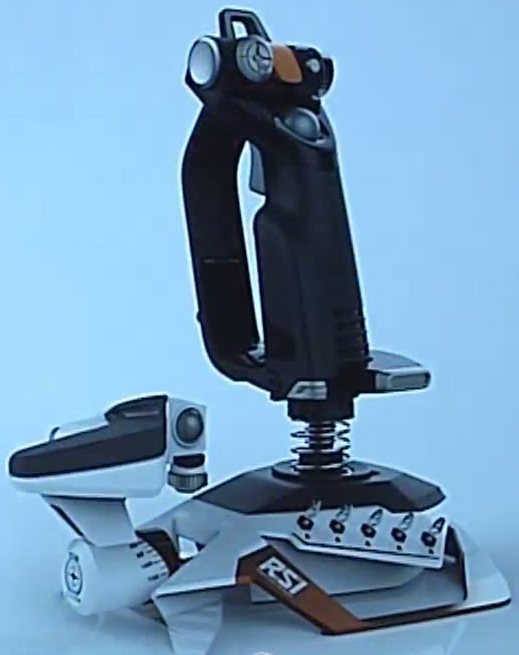 While the stick portion is modeled very similarly to the Saitek X-52, keep in mind the X-52 was used to model the flight stick in the Hornet in game. While it’s hard to say right now, without further word from Saitek or a demo setup to try out, the ‘low-end’ HOTAS seems useable, and desirable. It remains to be seen how build quality will stack up to its ~150$ price point, but we’ll hear more about that soon, hopefully. Moving on to the ‘high-end’ HOTAS now. While the ‘low-end’ HOTAS is small and compact, the ‘high-end’ system looks like a beast. 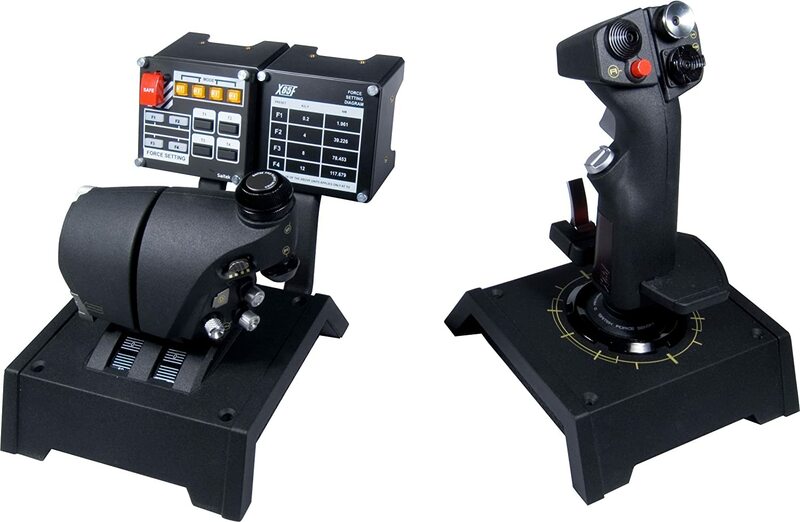 The ‘high-end’ HOTAS is based slightly off Saitek’s now-discontinued X-65 stick, and the similarities can be found, especially in the throttle, and the keypad above the throttle. But after that, the new Star Citizen HOTAS departs drastically from the original X-65, and sports a much smoother, more details, and, at first appearance, more functional layout. From the images we have, it’s unclear if it will have the same modularity as the ‘low-end’ variant, but it’s base looks solid enough that it definitely won’t need to be strapped to a keyboard to work properly. The ‘high-end’ stick also has a flip-up set of toggles and buttons just above the throttle. All in all, it looks like it has an innumerable amount of buttons. Combined with a touch-screen, which we at The Relay are very much hoping it has, this stick looks like it could do… just about everything you need to do to fly a ship in Star Citizen. From Reddit user /u/cavortingwebeasties, an expert joystick user and modder, we have a few choice quotes about what the new HOTAS’ could mean. Assuming the trackball is optical, accurate, and ergonomically accessible, I’m intrigued by this development. Controls are already a complicated and wordy subject though, and SC uses hybrid schemes that make it even more difficult for people to evaluate them objectively so there are a number of misconceptions fueling the fires, but that’s another subject. Kinda. The way I see it, trackball on a stick used in practice is close to how TrackIR is used. You will be predominantly flying/aiming with the stick, however using the trackball to essentially trim the gimbals towards the direction you are maneuvering to get a firing solution sooner than normal and with shallower attitudes but mostly ‘flying the reticule’ rather than constantly adjusting it to aim. I assume there will be a push-button re centering feature as well. I also see cases of fully tracking a target with it while not really focusing on control inputs (like shooting at a fleeing or distracted target). My guess is that the high end HOTAS will be ripe for mods like aftermarket gimbals with ball bearings, and will likely be my next target for left hand adaptation of its grip. Whether the trackballs are able to bring further parity to the mouse / joystick debate remains to be seen, but as /u/cavortingwebeasties says, it’s definitely an intriguing development. Moving on. 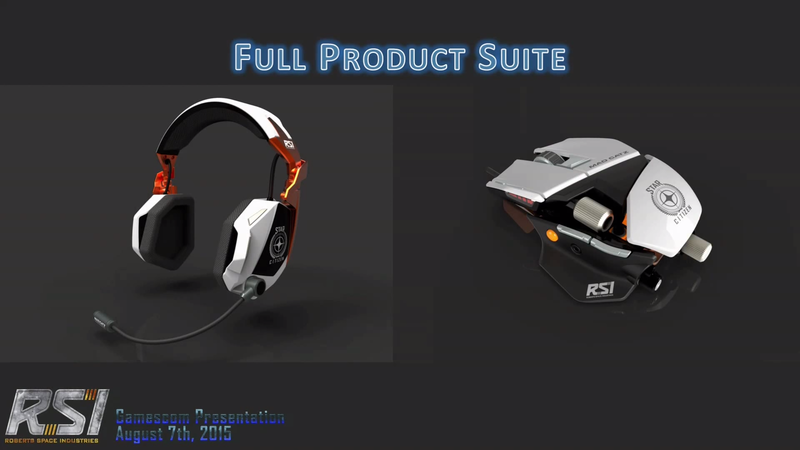 With the two HOTAS systems, CIG also showed off Mad Catz branded mice and headsets, and while they gave no details on either of them, it’s nice to know they will at least be coming. Done by Mad Catz instead of Saitek, the mouse looks like a fairly simple skin of one of Mad Catz’s R.A.T. 5 mice, while the headset appears to be a re-skin of the F.R.E.Q. 5. That said, while the joysticks appear to have had actual customization with Star Citizen in mind, the skins of the mouse, headset, and keyboard appear to be just that – simple reskins. Hopefully the rest of the SC hardware will be customized more over time, and will get the same effort that’s been put into making the HOTAS stand out for Star Citizen. Before we finish though, there’s one last thing to mention about the peripherals CIG have partnered with Saitek/Mad Catz to create. They will come from different ‘in-game’ manufacturers. You can get an RSI-skinned one in brilliant white and black, an Aegis one in deep red and black, or an Anvil one in what appears to be military green and silver. It looks like it’s just a cosmetic change, but even that… it’s a lovely touch. I purchased a Thrustmaster HOTAS X a year ago, so I could practice with a HOTAS, and then I waited and waited, because CIG had announced they would be building a HOTAS of their own. And now they have. And I am not disappointed. And, from a completely unrepresentative survey of The Relay members and fans… The pretty resounding conclusion is that we’ll almost all be picking up the high-end version. How this will end up, it’s hard to say. But it does sound like an interesting idea. Here’s hoping it’s done well. And now, for the interesting part. Here below are the questions we asked Saitek, as well as their responses. All answers provided by Mr Daniel Nuth, Product Development Manager for Mad Catz / Saitek. Are these Star Citizen-branded versions of existing designs, or are the products entirely new? Some are brand new designs, some are existing products with upgraded features. We found that there was a lot of support and enthusiasm at CIG for Saitek products. Many of the testers and developers use our products so they were already up to speed with the products in our range. The concept images that were shown, take into account what we think space sim gamers would appreciate to improve their gameplay experience. These were just concepts though, so we expect the product and features to improve over time. Can you give any information on pricing and availability? Currently no. We are at a stage where features and design are pretty fluid, so it’s difficult to finalize a product cost. We have targets that have been agreed between Saitek and CIG and we are working hard to meet them. Will these products be sold in retail stores? How many different SKUs are planned, and what are they? Are there variants tailored for specific in-game ships or manufacturers? 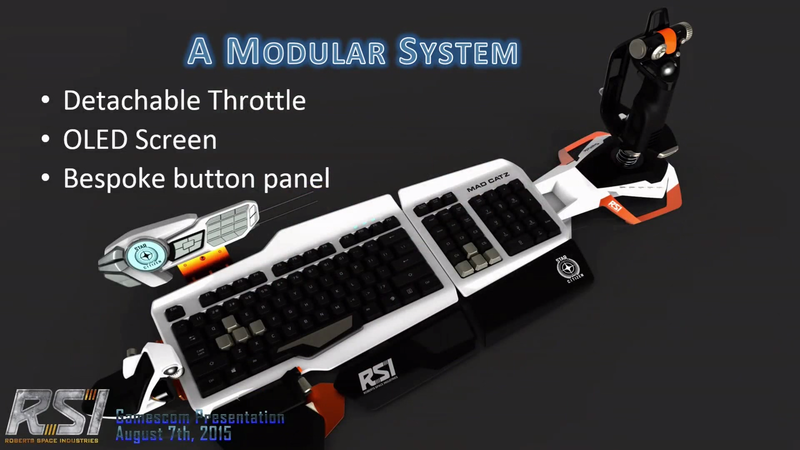 CiG and Saitek want to provide a full suite of products to use with the game. Mice, keyboards, headsets and HOTAS systems will be released. In terms of ship specific variants, we think Star Citizen fans will be pleased with what will be available for them when it comes to shipping the products. Can you provide us with pictures or other media of the products? At this time we sadly have nothing further which we can share! Are there any plans to distribute pre-release units to the press? There is a planned beta, whether this is with press or not is TBC between CIG and Saitek. Watch this space! How is the hardware constructed? Are they mostly made up of plastic or metal? What products (Saitek or otherwise) would they be comparable to? We are aiming to use the right material for the job. Metal provides improved structural rigidity over plastic, and also improves the cosmetic look of the product. The range will be built around premium controllers so there will be a mix of both metal and plastic in the right places to make the best product for the gamer. Some Star Citizen fans are cautious about Saitek’s build quality. Can you say anything that would assuage their fears? We absolutely stand by the quality of the Saitek simulation range, as do millions of happy customers the world over. Saitek has been number 1 in flight simulation for nearly 2 decades , and we’d like to think that we would not be in business today if we had issues with quality or longevity of our range. We have a well-established team of designers, engineers, quality experts and Contract Manufactures who we believe to be best in class in the industry. We read the feedback from the community as we treat any such consumer feedback seriously and we can assure fans that the products are being conceived, constructed , tested and build to meet the requirements of the most ardent of gamer/simmer. Will the hardware incorporate 6 degrees of freedom? Yes. The concept designs will include additional analogue axes for better control of strafing whilst in space. Gamers will be able to move in any direction and in any orientation they need to. Will these products be purely input or will they interface with the game itself? For example, will there be screens that display actual game information on any of the controllers, such as weapon heat or radar? So far, the plan is to have information going both ways. The best gaming experiences are those that share symbiosis between the Hardware and Software, our aim is to take simulation to the next level. Fans are going to be excited by what’s coming that’s for sure. How much communication did you have with CIG about their gameplay requirements, and what kind of special considerations have gone into the hardware to deal with Star Citizen’s gameplay mechanics – for example, the difference between space and atmospheric flight? We have a very good working relationship with CIG. Their team visit us and vice versa, and they provided us with a broad idea of what they expected for any licensed peripherals. We also have a number of avid space sim gamers in our office, as well as people who are new to these types of games. Their game testing and feedback is crucial for the design of the new products. For example, the concept images show fully integrated trackballs on the new controller. These are critical for improving gimbaled weapon aiming above and beyond what is currently achievable. We also needed to improve the strafe control for added freedom of movement. This, we believe to be vital for complex manoeuvres during landing, take-off, docking and combat, so, we have taken steps to make this is easy as possible for the user. Finally, we wanted to present a modular range, so that customers could build and expand their ideal setup with different controllers. This is at the core of the Mad Catz and Saitek philosophy, so it makes perfect sense for these products to interface and connect with each other, enabling users to create the perfect control setup. Do you have plans for specialized software to go along with the new equipment? Ideally, we want these products to be fully configurable within the game. However, we can also supply our own software so that users can create their own setup profiles if they prefer to do this. Are there any plans for interchangeable grips for larger / smaller hands? At this stage, we can say that adjustability is as the core of what we do, and this has been part of the discussion from day one. Some of the final products should have adjustability to some degree. We’d like to thank Saitek for responding to our questions. So, with all that said, what do YOU think? Do you agree with us? Do you disagree? Let us know what you think. Do you plan on picking up the HOTAS when it launches, and what price do you think the high-end model will cost?. There are still many, many questions left to answer, about both models of HOTAS as well as the other SC peripherals, and The Relay will answer those as soon as we possibly can.